21 September 2016: Sharp launched the sales of the Robohon Sumaho smartphone-with-robot bundle, a limited 100 sets offer, at the – frankly – insane price of 224,640 Yen or 2,212 USD! The bundled smartphone is a low-to-mid-range device of the EDGEST series - reduced top and sides bezel, a design that was abandoned in Sharp's 2016 collection. It features a non-IGZO, 5-inch HD (1280 x 720 px) display using the S-PureLED backlight technology, a quad-core Snapdragon 400 (MSM8926) processor clocked at 1.2 GHz, 2 GB of RAM, and 16 GB of built-in storage memory that can be expanded by up to 32 GB using SDHC microSD cards. The device comes with the now obsolete Android 5.0, upgrades not likely. LTE: Band1 (2.0GHz), Band3 (1.7GHz), Band19 (800MHz), Band21 (1.5GHz) - VoLTE supported. 3G: Band1 (2.0GHz), Band6 (800MHz), Band19 (800MHz). Further connectivity options include IEEE 802.11b/g/n (but the n-standard only supports 2.4 GHz), Infrared, and Bluetooth 4.0 (BLE). At least it's waterproof (IPX5/7), capless, but not dustproof. The 13.1 megapixel camera features Sharp's NightCatch mode for shooting in the dark, real-time HDR, time-lapse-capable sensor, as well as the convenient Framing Advisor function for improved arrangement of the photographed objects. Continuous shooting is also supported. The inner camera is 2.1-megapixel and has a one-touch timer. Naturally, the device comes with a pre-installed application to control the bundled Robohon via a Bluetooth connection. Read about the Robohon here. The Aquos Robohon features the Grip Magic sensor that enables a variety of convenient options, including "Off by putting in pocket" and Bright Keep to keep the backlight on and inhibit screen rotation while holding the device. The battery capacity is 2,450 mAh. it weighs 145 grams and measures 134 × 71 × 9.9mm. 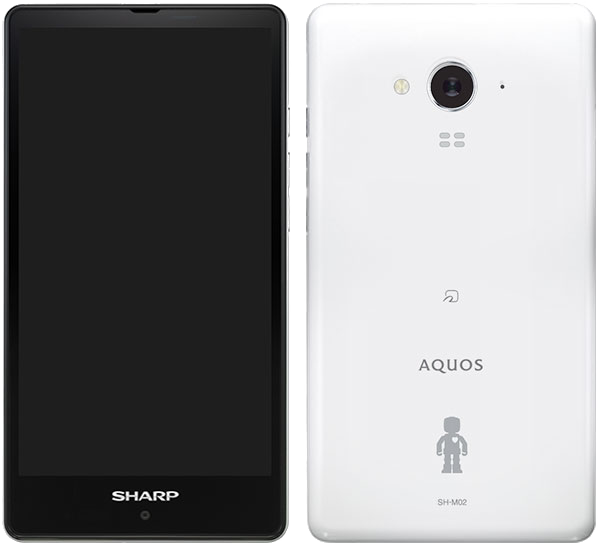 The Aquos Robohon is only offered in one colour combination: white for the back and white for the front.